Mega-City One, 2134 AD. 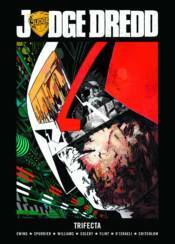 While a severely depleted Justice Department struggles to cope in the aftermath of Chaos Day, Judge Dredd becomes aware of a potential power grab from within. Meanwhile 'Wally Squad' gumshoe Jack Point is given a mysterious doll to safeguard, and Dirty Frank wakes up on Luna-1 only to discover that he is now a board member of Overdrive Inc.! It's business as (un)usual for the three Mega-City One lawmen, and as their cases intertwine they'll need to work together in order to save the city from total destruction!